To be in a relationship means we’ll eventually face conflicts. Instead of denying, avoiding, or managing conflicts afterwards, tensions could be part of the relational ecosystem we build everyday in our social and professional life. Gabriel Siqueira has always been intrigued by how to conciliate participation with effectiveness. Since 2001, he has been researching innovative management methodologies and has specialized in developing collaborative tools for a sustainable future. His purpose in life is to support organizations and people to balance productivity, meaning, self-actualization, autonomy and pragmatic horizontal decision-making. Gabriel Siqueira provides training and consultancy for companies, teams and organizations. He’s a certified trainer in Dragon Dreaming and integrates Sociocracy S3, Design Thinking, Zegg Forum for community building and Non-Violent Communication within the work he offers. 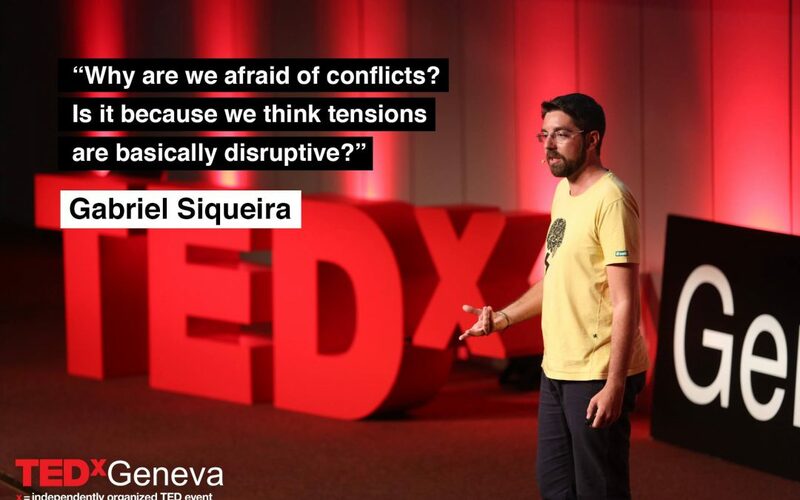 In his Masters in Management, Gabriel Siqueira researched how organizations innovate. He mapped and studied 101 of the most creative and dynamic organizations of Brazil: ecovillages, cohousing and alternative communities. Later Gabriel co-founded an ecovillage in the South of Bahia, where he lived with his wife and two kids for 5 years. He discovered conflicts are part of human existence and unveiled several paths to healthier relationships and conflict resolution. Click here to watch all presentations of TEDxGeneva 2017: Future Crossroads.